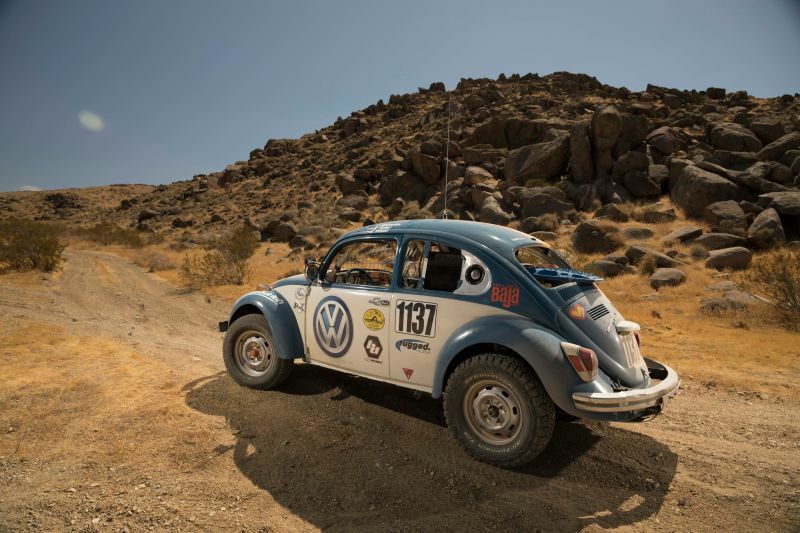 For the first time, Volkswagen has decided to support a factory team in this year’s Baja 1000 desert run. The Baja is the toughest test of man and machine around and the automaker is supporting a Denver-based racing team, ProjectBaja. When they say that you “run what ya’ brung” for the Baja 1000 you would think that kicks off today in Baja California, you would think that the “brung” part would be a beefed-up four-by-four pickup with knobby off-road rubber. Or, in the case of the 1000, maybe an off-road bike with rubber that will take you 1,134 miles across the Baja. The race will take the participants from Ensenada, Baja California, Mexico to La Paz, Baja California Sur. Running the toughest four-day run through the desert, where often the route is little more than a slight track in the sand, and the nearest pitstop is nearly 1,000 miles away, will be a variety of iron. The vehicles will range from off-road pickups to older modifieds to dune buggies and other assorted cars and trucks. One of the vehicles taking part in this year’s Baja is a VW Beetle. Now, given the nature of the race, a Bug’s participation is nothing startling as there have been Bugs running since the first Baja. However, the Beetle in question this year is one that dates from the earliest 1000s, a 1970 Bug. The first Baja 1000 ran in 1967. Called “Tope” by the crew that took it apart and put it back together, when the flag drops it will be off over a landscape that features a mix of roads, primitive paths, and trails, only stopping for fuel or repairs, as the case may be. Though VWs have long been part of the Baja, whether as modifieds or dune buggies, this is the first year that Volkswagen has sponsored a race team, ProjectBaja of Denver. The ProjectBaja team kept the Beetle’s original stock 1.6-liter, air-cooled flat-four powerplant. They ditched the original gas tank, replacing it with a 22-gallon racing fuel tank. The team upgraded the tires to a set of beefier BF Goodrich All Terrains. And, they also improved the suspension with external-reservoir Fox shocks and stiffer springs all of which should help “Tope” handle the harsh desert terrain. Also, the guys also added skid plates front and rear for protection. Since there aren’t any street lights in this particular part of the world, crews have to supply their off-road illumination which ProjectBaja did. Meantime, they ripped out anything that wasn’t necessary, and they installed a rollcage and racing harnesses for safety. By now, you have probably noticed that “Tope” kept its stock look which is the idea behind Class 11 Baja racing, the group in which the VW will be running. Class 11 is for stock Beetles. The rules state that the cars have to be as close to factory spec as possible. The only mods allowed are those needed for safety, as well as so vehicles can survive the Baja. The race includes a mix of classes from nearly stock trucks to bikes and the oversized purpose-built off-road racing trucks. Indeed the huge rigs are the ones competing for the overall win. By the way, if you are wondering why VW chose to get involved in Baja, it is simple: what better way to remind us of its racing heritage. VW is reportedly continuing its racing push by designing an all-electric racer for next summer’s Pike’s Peak Hill Climb.